Rick Foris has been making pottery since 1970. For the past 30 years he has worked almost exclusively with raku, a method of firing pottery in which the piece is placed in a heated kiln, removed when red hot and put into a container filled with a combustible material, such as sawdust. All of Rick’s work is done solely by him. His pieces are wheel thrown and contain many hand built additions and bases. All are raku fired. Many are finished with acrylics. 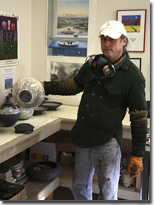 2006 is the ninth year that Rick Foris has shown his raku pottery at Cherry Creek Arts Festival. He won First Place in Ceramics in 1994. Other awards he has won include Best of Show at Des Moines Art Festival, Awards of Excellence at Lakefront in Milwaukee, and at Coconut Grove, Madison, and Shaw Art Festival in St. Louis. His work is included in many publications, including Raku by Tim Andrews (2004), Raku, by John Mathieson (2002), Raku - Investigations into Fire by David Jones, (1999) and Raku Pottery by Robert Piepenburg (1998). Some of the permanent collections representing Rick’s work include the Milwaukee Art Museum, Wustum Museum of Fine Art in Racine, WI, Waddell and Reed Mutual Fund Corp. of Kansas City, Nikko Hotels, Byer Museum of the Arts, University of Wisconsin and the Peter David Louis Memorial Collection at VISAC in Trail, BC, Canada. A Wisconsin native, Rick attained his Bachelor's degree from the University of Wisconsin at Stevens Point. He works out of a studio behind his home and is an avid fly fisherman.